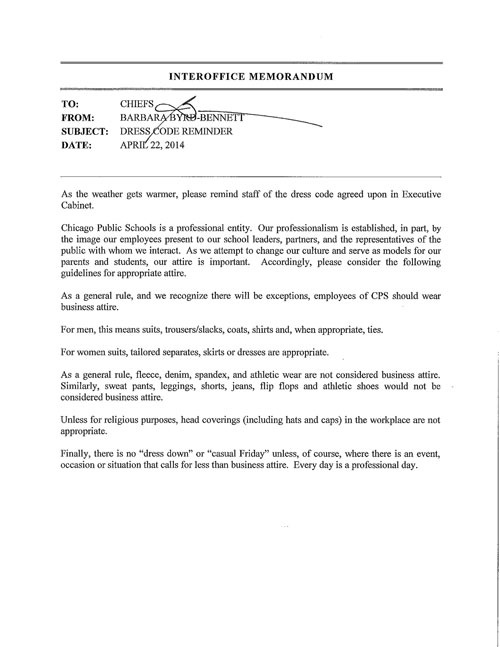 In a memo sent network chiefs, Chicago public schools CEO Barbara Byrd-Bennet laid out a "general rule" that CPS employees should wear business attire. The memo was dated April 22 and shared to some schools' staffs on April 29. However, the directive was meant for network chiefs and their staffs only, not teachers and other school workers, according to Chicago Teachers Union officers. As the weather gets warmer, please remind staff of the dress code agreed upon in Executive Cabinet. Some network chiefs forwarded the memo to principals on April 28, 2014.Chicago Public Schools is a professional entity. Our professionalism is established, in part, by the image our employees present to our school leaders, partners, and the representatives of the public with whom we interact. As we attempt to change our culture and serve as models for our parents and students, our attire is important. Accordingly, please consider the following guidelines for appropriate attire. As a general rule, and we recognize there will be exceptions, employees of CPS should wear business attire. For men, this means suits, trousers/slacks, coats, shirts and, when appropriate, ties. For women suits, tailored separates, skirts or dresses are appropriate. As a general rule, fleece, denim spandex, and athletic wear are not considered business attire. Similarly, sweat pants, leggings, shorts, jeans, flip flops and athletic shoes would not be considered business attire. Unless for religious purposes, head coverings (including hats and caps) in the workplace are not appropriate. Finally, there is no "dress down" or "casual Friday" unless, of course, where there is an event, occasion or situation that calls for less than business attire. Every day is a professional day.